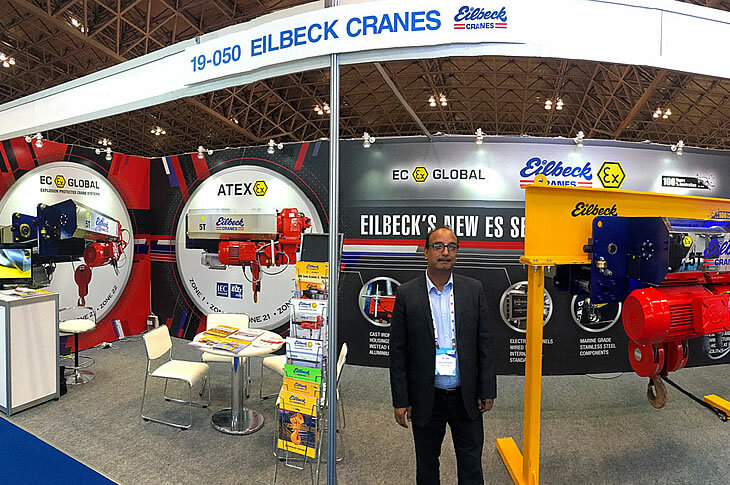 Once again Eilbeck Cranes has participated in the Gastech Oil and Gas Exhibition and Conference that’s taken place in Tokyo, Japan in 2017. 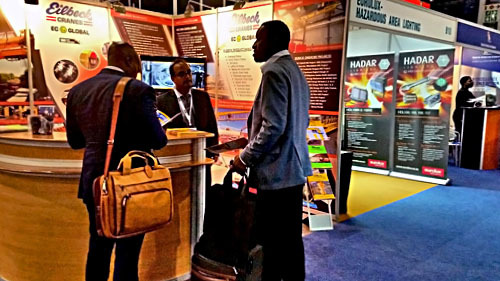 This is the largest Oil and Gas exhibition in the world with 600+ exhibitors, attracting 25,000+ visitors. We took this opportunity to present our exciting new range of explosion proof and standard hoists, the ES Series that has been in concept stage over recent years and now being manufactured in our Australian purpose-built facilities. 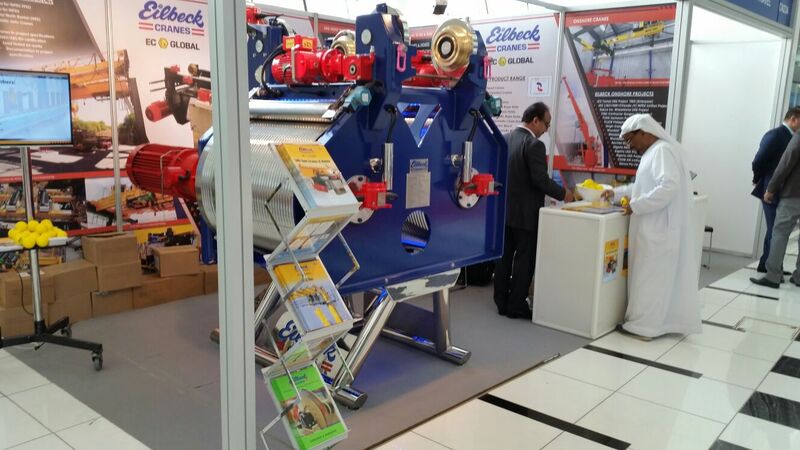 This new explosion proof product is set to become a serious contender on the international market. 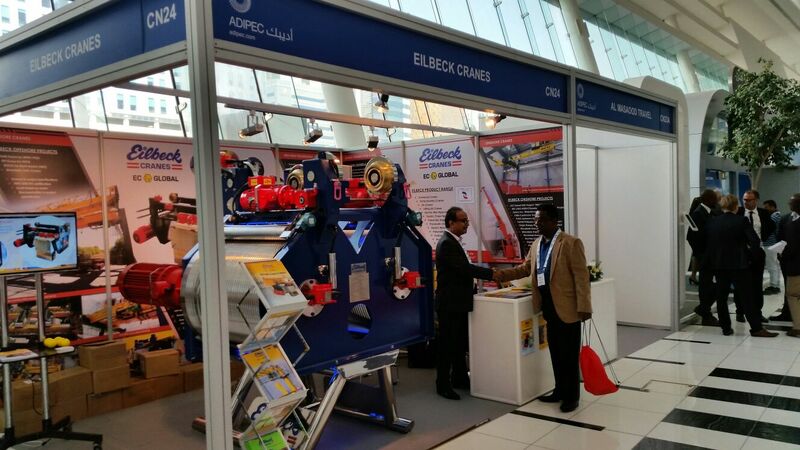 Our designers and engineers worked tirelessly to develop a product Eilbeck Cranes are proud to distribute. It is built with the highest quality, modularity and adaptability. 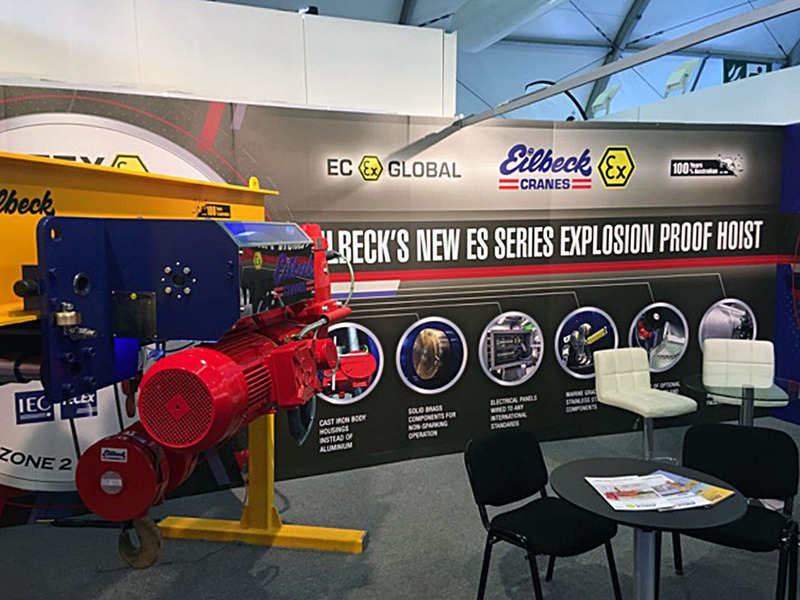 Eilbeck have had the opportunity to supply the newly engineered explosion proof hoist to a variety of internationally renowned companies such as True Blue Energy and Newmont Asia Pacific. 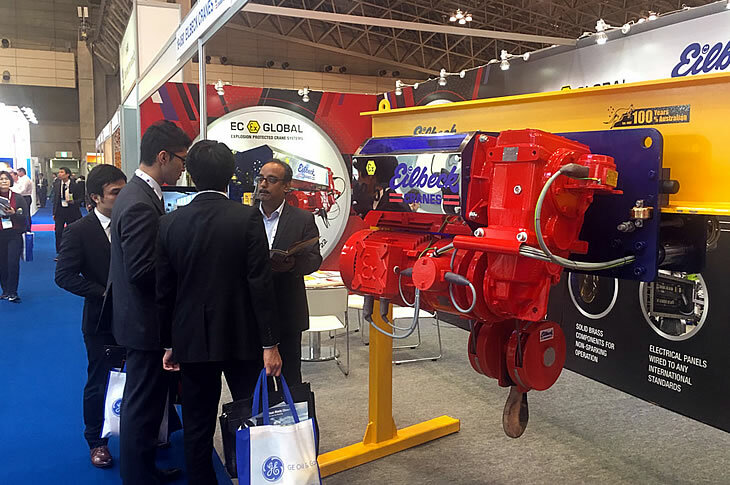 At Gastech we were excited to present our product and engage in business discussions with Japanese EPC companies such as JGC, Chiyoda, Toyo, Mitsubishi, IHI and Kawasaki that are all involved in Oil & Gas projects across the globe. 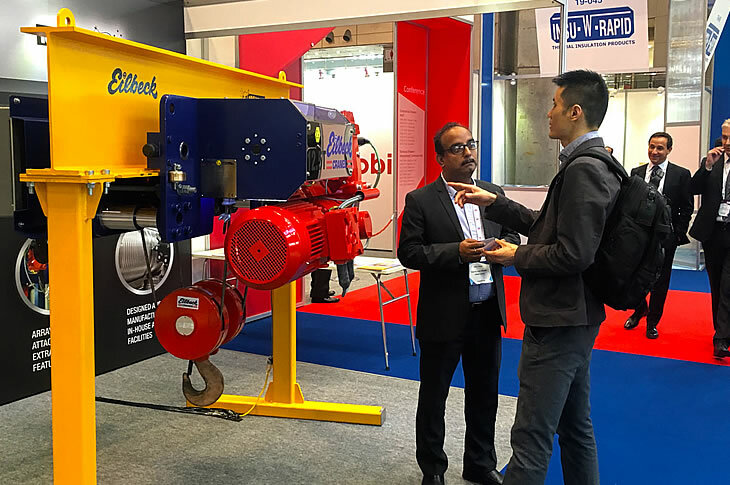 Eilbeck Cranes raised interest not only through the new ES Series Hoist range but also with our double-drum, full redundancy LNG Tank Pump Handling Hoists built specifically for operation in extremely cold temperatures. Overall the time spent in Tokyo was very rewarding as we gained new leads and business partners resulting in new projects. From the information collected in the market it is clear that our product is very competitive with price and quality. 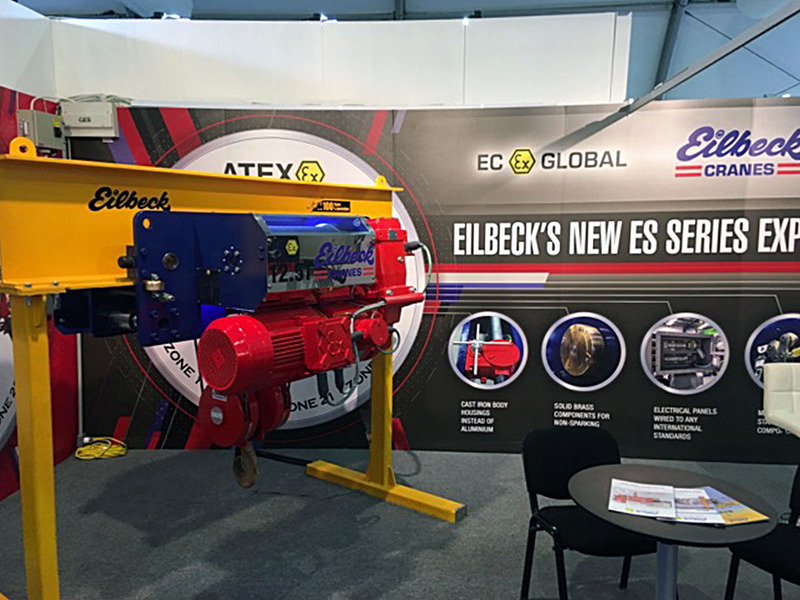 Eilbeck marked their presence with the new Ex-proof hoist series ES, designed specifically to satisfy the Oil & Gas requirements. 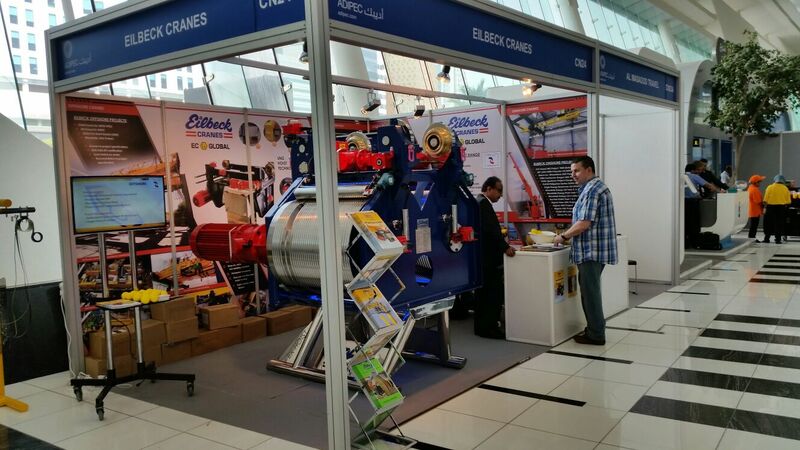 Eilbeck Cranes has been serving the Middle Eastern market from Australia and our presence at the show was meant to provide us with the most direct route to the world’s most prolific buyers and specifiers of Oil & Gas services and products. Each year ADIPEC delivers an unrivalled audience of Oil & Gas professionals with real buying power, enabling more than US$9.76 billion of business to be conducted onsite at the event. We joined the Expo where all the world’s leading companies were present, met EPCMs, End user, Buyers, Engineers and received leads and valuable contacts for the prospective business. 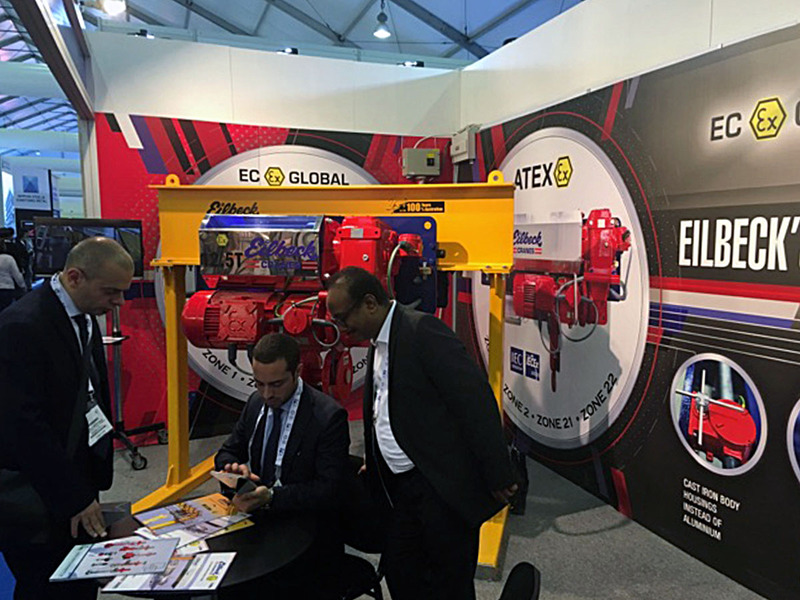 We took the opportunity to display our own very special double drum LNG Tank Pump Handling Hoist designed and manufactured to operate in sub-zero temperatures dropping to -50°C. 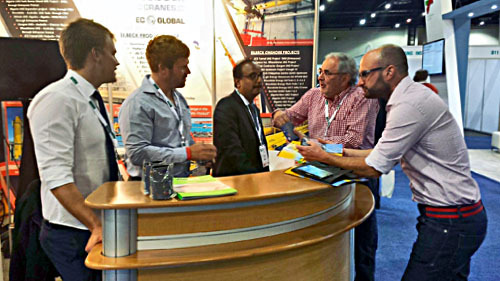 The Hoist attracted a lot of engineers, buyers and end users. We have also received a lot of enquires for representation opportunities and will soon have our local agents in the Middle East. 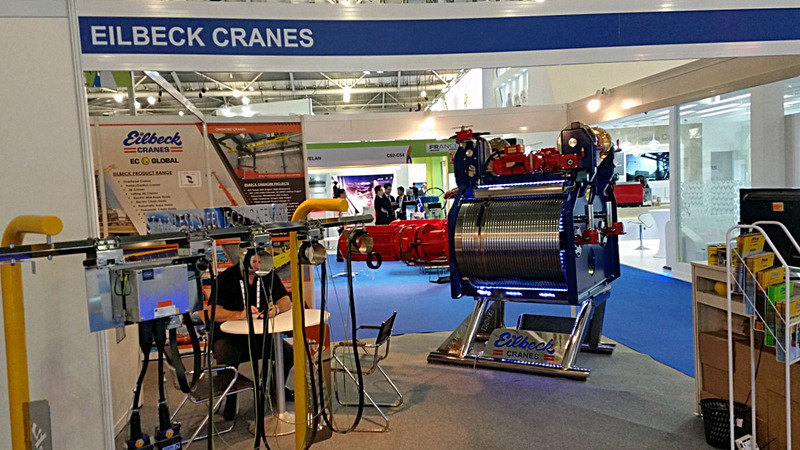 Eilbeck Cranes were showcasing one of the heaviest pieces of equipment at Gastech: "The LNG Tank Crane Hoist on display is destined for installation on the YAMAL LNG project. Eilbeck has developed the tank cranes and hoists for operation in the harsh Arctic conditions. The Ex rated double drum hoist features full redundancy backup to ensure 100% safety and reliability for the critical removal and replacement of the LNG pumps. 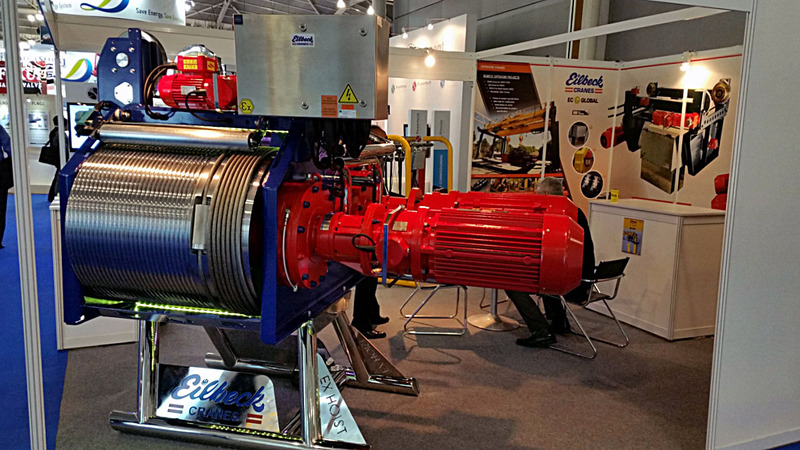 The rope drums feature a cut out pocket to accommodate a wind on rope coupling adaptor to enable the connection and disconnection of the pump service wire rope during operation. The displayed hoist will be fitted to one of the four jib cranes Eilbeck is supplying to the project. The tank cranes feature fully enclosed insulated and heated housings for the entire boom to ensure full availability in the harshest operating conditions". 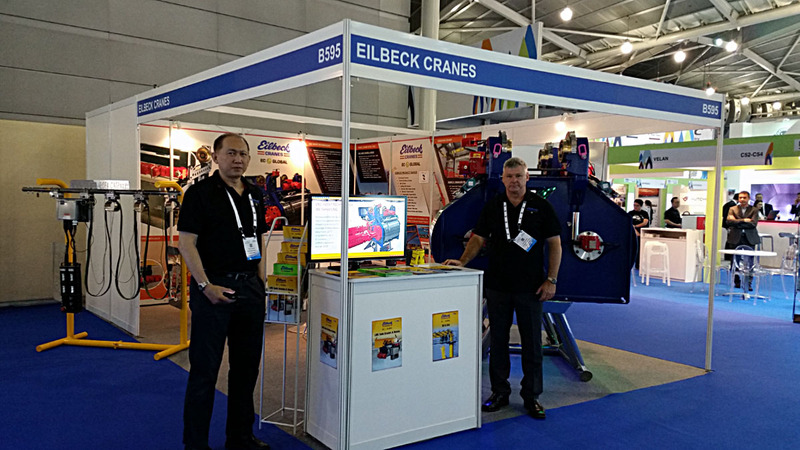 Following the market trend of adapting more and more FLNG than land base plant, Eilbeck Cranes increased the focus marketing towards Offshore Cranes and Hoists for FLNG/FPSO projects and have participated FPSO World congress in 2014 and 2015 in Singapore. Eilbeck Cranes also successfully completed the supply of cranes for DSME and SHI for Ichthys FPSO and CPF offshore projects. Meeting all Design and DNV design approval, specification, documentation and quality special requirement. FPSO being the show for offshore granted us the opportunity to meet and demonstrate our capability in front of prospective buyer/ client, EPCM, shipbuilders, engineers and end user. 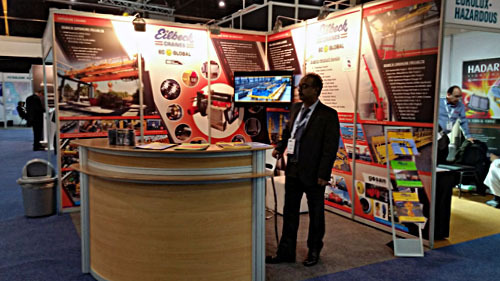 Eilbeck Cranes has participated in the Africa Oil and Gas Expo again in 2015. It was good opportunity to meet prospective and existing clients. 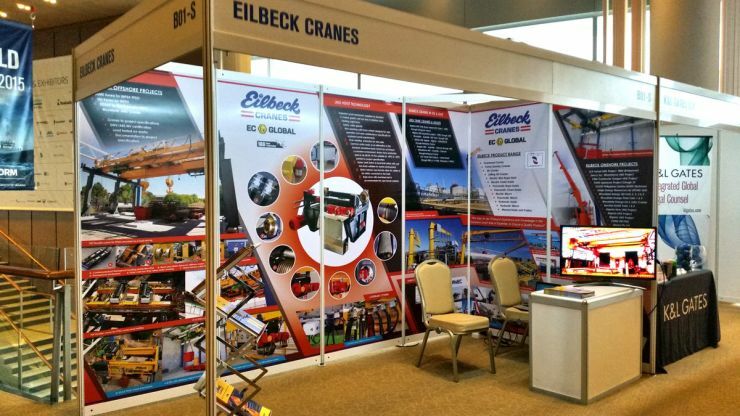 Eilbeck Cranes was serving the African Market from Australia and was looking for local representation. At this Expo we met and discussed with a number of prospective local partners and finally we have our representation in Africa. One of our Partner is in Johannesburg, serving the Mining, Oil and Gas for more than 20 years Africa wide. We also met a lot of prospect clients, EPCM companies, end user and have received leads.